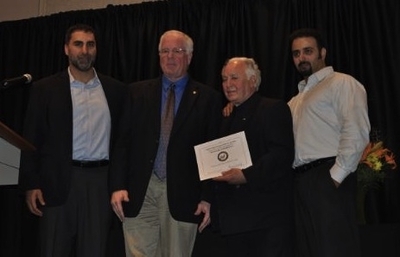 Bill Aossey (center right), accompanied by sons Jalel (left) and Yahya (right), receives a certificate of recognition for 40 years of business in Iowa from Fred Schuster, Regional Director for Senator Chuck Grassley, in 2014. On July 21, 2015, the federal government filed a response in opposition to defendants' Establishment and Free Exercise Clause challenge to its criminal prosecution in the Northern District of Iowa case, United States v. Aossey, et al. For background, see the defendants' memorandum in support of their motion and IW's prior article on the subject. The government argues that the case will not excessively involve it in religion, because it "takes no position as to what constitutes a proper 'Halal' slaughter." It explains, "The case will not place in issue whether those standards are proper under Islamic law, only whether defendants knowingly sold products that did not comport with represented standards [i.e., standards represented by defendants]" about the method of slaughter. "The use of penetrative captive bolt stunning in any capacity negates the Halal slaughter process." A practicing Muslim conducted the slaughter of all animals and recited a specific prayer aloud while conducting the slaughter. Midamar products have been approved by Malaysia, Indonesia, Kuwait, and the United Arab Emirates, etc., and comply with their laws and requirements [the gist of which is that the meat must be halal]. The government continues its argument that the case won't excessively entangle it with religion by presenting an imaginary prosecution of an imaginary salesman who sold tap water as though it were holy water from Rome blessed by the pope. Evidently, the government couldn't find a real case with which to make the point.